Over the last two decades there has been a dramatic increase in the monitoring of undersea seismic variation, in part because the technique has been successfully applied to many large hydrocarbon fields, especially in the North Sea. But just one seismic survey can generate 7 TB of data or more, requiring massive computer clusters capable of handing these large data volumes within reasonably short time frames. Additionally, a critical factor in these types of time-lapse seismic survey is the repetition of the seismic experiment between two or more surveys as accurately as possible. Currently, repeated seismic processing can typically be done within a week or less. This approach can be used to improve oil field production and to monitor the movement of CO2 injected into undersea reservoirs, whether for storage or for improving oil field performance. While massive computer processing is an absolutely essential part of seismic variation monitoring, another critical aspect has been the development of high-precision positioning equipment, which is a cornerstone for time-lapse seismic monitoring. In addition to this, the industry has developed dedicated, steerable streamers, as well as cables that are permanently installed in the seafloor above the reservoir. The Valhall Field is one example of this approach. Nine surveys have been acquired there since 2003, giving a total volume of seismic data of the order of 70 TB. Figure 1: The basic principle of 4D seismic: the repeated seismic signal (recording time along the vertical axis) is similar to the pre-production signal from the top reservoir event (dashed red line) and downwards to midway between the top reservoir and the oil-water contact (OWC, green dashed line). The oil-water contact shows a dramatic change in the seismic response, interpreted as water replacing oil from this level and approximately 40m above. The two black dashed lines below the reservoir show a travel time change (time shift) that is used to compute how much water has replaced the oil. The careful processing of time-lapse seismic data results in clear images of production-related changes. Figure 1 shows two stacked traces from a given location at the Gullfaks Field in the North Sea, one acquired prior to production starting (1985) and the other after nine years of production (1995). 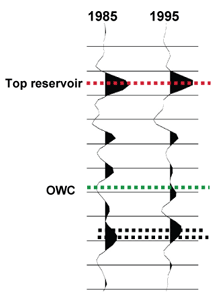 Notice that the two signals are similar from the top down to midway between top reservoir (marked by a red dashed line) and the base of the reservoir (green dashed line). From mid-reservoir down to the base reservoir, represented by the original oil-water contact (OWC), we observe significant changes in the seismic signal, which is interpreted as water having replaced oil in the lower part of the reservoir. Since the sound velocity of water is higher than that of oil, the travel time for a seismic wave passing the whole reservoir section will decrease when water replaces oil, which is shown here as a time shift for the event below the base reservoir (marked by two black dashed lines). By exploiting this 4D seismic monitoring technique at the Gullfaks Field, StatoilHydro has reported a net increase in income of approximately 1 billion USD. Interest in CO2 injection, both for storage and as a tertiary recovery method for increased hydrocarbon production, has grown significantly over the last decade. StatoilHydro has stored approximately 10 million tonnes of CO2 in the Utsira formation at the Sleipner Field, and several similar projects are now being launched worldwide. At NTNU our focus has been to develop geophysical methods to monitor the CO2 injection process, and particularly to try to directly quantify the volume injected from geophysical data. One way to improve our understanding of how the CO2 flows in a porous rock is to perform small-scale flooding experiments on long core samples. An example of such a flooding experiment and corresponding X-ray images for various flooding patterns is shown in Figure 2. By measuring acoustic velocities as the flooding experiment is conducted, these experiments can be used to establish a link between pore-scale CO2 injection and time-lapse seismic data on the field scale. Figure 2: Long core (left) showing the location for the X-ray cross section (red arrow). Water injection is 50 g/L. X-ray density maps (right) of a core slice showing six time steps during the injection process (from Marsala and Landrø, EAGE extended abstracts, 2005). Figure 3 shows an example of CO2 influencing seismic data over time. By combining 4D travel time and amplitude changes, we have developed methods to estimate the thickness of CO2 layers, which makes it possible to estimate volumes. Another key parameter is CO2 saturation, which can be estimated using rock physics measurements and models. Although the precision in both 4D seismic methods and rock physics is increasing, there is no doubt that precise estimates are hard to achieve, and we therefore need to improve and combine existing methods in order to decrease the associated uncertainties. Figure 3: Time-lapse seismic data showing monitoring of the CO2 injection at Sleipner. The strong amplitude increase (shown in blue) is interpreted as a thin CO2 layer. The dashed red lines indicate top and base of the Utsira sand layer (printed with permission from StatoilHydro). StatoilHydro is acknowledged for permission to use and present the seismic data examples. The Research Council of Norway is acknowledged for financial support for the ROSE (ROck SEismic) project at NTNU.